Stephen Anderson’s film trembles in the shadow of Brad Bird’s The Incredibles. Meet the Robinsons trembles in the shadow of The Incredibles. The intent of Brad Bird’s Pixar film wasn’t simply to be family-friendly but to symbolize and understand family ties. 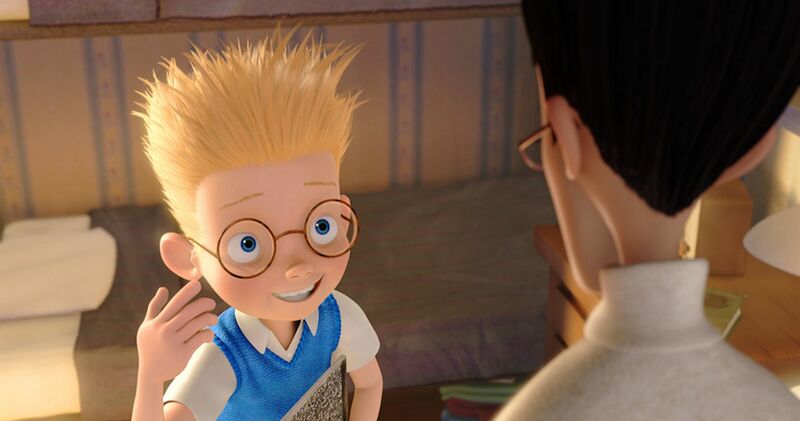 Conversely, the only thing Meet the Robinsons wants to capture is the attention of its prospective audience. In this case, the film’s dubious 3D presentation serves to distract from what is a rather dull storyline. The perfect 3D film has yet to be made, and though Meet the Robinsons is actually notable for refusing to bombard the fourth wall with endless pointy things or globs of goo, the fact that you forget you’re even watching a 3D film after a while points to the presentation’s failure. Suggesting a twee version of Back to the Future, the film begins in the past with a mother leaving her newborn on the doorway of an orphanage. Years later, an apparently unadoptable Lewis has grown into a genius who struggles day and night to come up with a functional invention. Oblivious that his Memory Scanner was sabotaged by the hat-like gizmo commanded by some effeminately long-legged ghoul identified as the Bowler Hat Guy, Lewis accepts failure until he ends up in the future—courtesy of a mysterious time traveler known as Wilbur—and meets the madcap Robinson clan, from whom he learns valuable life lessons. Every Robinson has their own unique eccentricity but no discernable sense of humanity. This is because each one is introduced in such a spastic fashion that none register beyond archetypes. Perhaps understanding this, the filmmakers introduce them over and over again. Even then, you’re bound to fail the hypothetical pop quiz that asks you to identify each one. Other than a very funny allusion to Tom Selleck (one of the film’s voices), Meet the Robinsons isn’t soaked in obnoxious pop-culture references, but its vision of the future (human transport via bubble, a theme park called Tomorrow Land, and buildings that are constructed in an instant—hence the name Insta-Building) is as safe to the eyes as a Candy Land game board. In the interest of preserving a last-act revelation, the film flirts with incoherence for much of its running time, and though a crucial decision Lewis makes during the last act is touching, speaking profoundly to the significance of familial surrogacy, every message Lewis—and, by extension, the audience—adopts (like “Keep moving forward!”) is shoehorned into the story with incessantly unattractive desperation.